Janet Birch, Head of Science at Two Boats School on Ascension Island took up post two years ago and recognised that the laboratory facilities needed modernising and upgrading. Following the COBIS (Council of British International Schools ) Webinar presented by S+B and designed to provide schools with information relating to current school lab design regulations and recommendations, design and furniture options available, pro`s and con`s associated with each and current trends amongst International Schools worldwide, Janet contacted S+B to establish some budget costings for alternatives layouts and specification levels. Following a visit to the S+B factory, offices and showrooms in Manchester, consideration was given to several different design options. Janet was determined to ensure that although the school is in the middle of the Atlantic, that what they ended up with was equal to that being supplied into other International Schools. 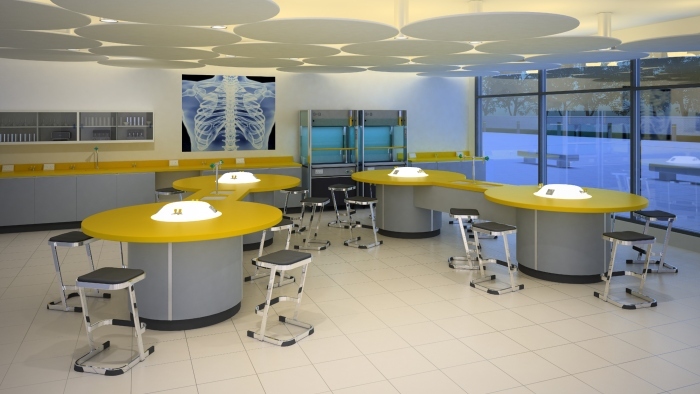 Eventually she and the school chose a combination of serviced Saturn workstations and moveable tables with high performance Corian worksurfaces. This choice will provide the school with the flexibility to deliver Biology, Chemistry and Physics in one lab and to facilitate both collaborative group learning and more conventional whole class address teaching. School maintenance staff will be installing the furniture and to assist, S+B are providing easy to build sub-assemblies and self-assembly diagrams with written instructions. Logistics are quite a challenge since normal commercial delivery companies do not include Ascension Island on their regular routes, the British Military are helping the school and will be using one of their regular supply ships to get the goods to the island. To find out more about the Saturn furniture system featured in the video download the PDF brochure or visit our Case Studies page to discover other completed projects.